Introducing ROM's amazing new Kaleido fabric. A robust, easy to clean fabric, a perfect pet friendly sofas for a household filled with all the chalenges of a busy life. 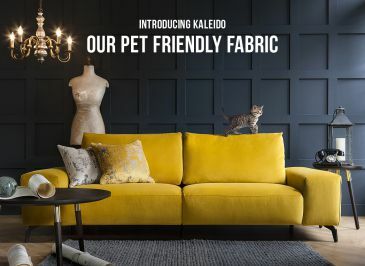 The Kaleido pet friendly fabric is super smooth so it's really easy to remove pet hairs. It is also designed to be anti-static, so the hair doesn't stick like it would on other fabrics. Whether you're looking for dog proof or child-friendly fabrics, the Kaleido wil resist stains from any source. Your covered if the dog brings back some of the garden or baby throws their dinner away without warning. Even the cat can't ruin the Kaleido fabric, with the sharpest claws falling short to our anti-scratch technology. It should be noted that even Kaleido isn't invinsible and strong powerful pets can still ruin the fabric with strong clawing and bites. But it will withstand much better than other tissue. Find out more about pet proof fabric sofas and discover where to buy here.